One of the best makeup schools – Chic Studios is opening a new location in Denver, Colorado and today we speak with Amy(founder), who’s going to tell us more about a new location, events and much more! 1) Amy, please tell us about 2017 achievements and plans for 2018. We have had so many achievements in the past year, but the most notable was moving locations from Santa Monica to downtown Los Angeles. It was a huge change for the better and now we are surrounded by inspiration from the Fashion District, Art Galleries and incredible creative spaces. 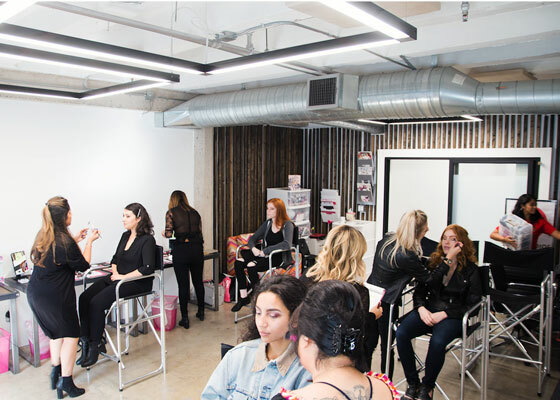 Our Makeup School in LA is located in a building complete with kitchenette, a library of fashion and beauty books, a 3-D printer, 2 photo studios, and much more. With two successful locations in New York and Los Angeles, We have chosen Denver Makeup School as our next home and hope to bring beauty into the city in April. Located in ‘LoDo‘, which is the oldest neighborhood in Denver, it is historically beautiful and a perfect spot for Chic Studios where we thrive on inspiration, and it can surely be found everywhere in this area. 2) Can you tell us more about your LA location and upcoming Denver location? 3) What can students expect from Chic Studios? We offer courses, classes, and workshops for beginners, intermediate, and advanced artists. Whether you’re a seasoned artist wanting to enhance and rebuild your skills or someone who has never applied makeup on anyone rather than yourself, we have a course for you. We guarantee world class education from our instructors who all have 10+ years in the beauty industry and still freelance when they are not in the classroom, Chic Team. In two to four weeks, students become certified makeup artist at Chic Studios! We start off with our Beauty Makeup Course and from there, students can build their skills ranging from a winged liner, contour + highlight, smokey eyes, and bridal makeup. Students are given a choice of add-ons, TV + Music Video or Fashion Runway and towards the end of their course, they are given a portfolio photoshoot where the photos taken are used to jumpstart their professional portfolio. 4) What should they do after they finished your courses? Upon completion of any of our Professional Makeup Course NYC + LA + Denver, we send recent graduates application for PRO cards as well as add them to our private network called the Chic Pro Community. Not only is it a network where they can connect with other Chic Studios grads from around the country, but we also post jobs, opportunities, invitations to exclusive shopping events and more! Enrolling into Chic Studios will better your understanding in not only the basics and fundamentals of makeup artistry but how to set up and build your freelance makeup business. 5) We know that you have amazing teachers who work with celebrities, is there any tips how to become a successful makeup artist in this industry? Our instructors are talented and driven, with over 10+ years in the pro-industry, and are still working. When they’re not teaching classes, during the weekends, they’re part of editorial shoots, runway shows, music videos, etc. Some of them are influencers as well, so it’s great to have a variety of artists on our team working in different parts of the industry when they’re not in the classroom. Our instructors know the importance of social media, so we love catching up on amazing gigs they’ve done through Instagram. A couple of our instructors are so well-versed that they’re currently teaching our Digital Beauty Influencer (DBI) Course. 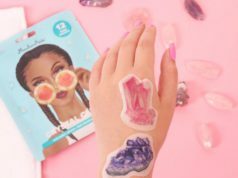 We usually talk about how to start up a freelance business but with this course (the only course where students put makeup on themselves), we help students market their own brand to reach the masses. We go over video tutorials and how to film and edit them with your phone. Towards the end of the course, students have enough content to post on their own professional makeup pages and we make sure they go live sometime towards the last day of their course. It’s a great way for our students to break out of their shells and engage with their growing audience. 6) Amy, please tell us about Chic Studios events? Every month, we have Open Houses, free for all attendees and open to the public at our NYC and LA locations. We have a central theme which is also the demo look, activations for attendees (beauty bar), and makeup gifts. These events are a great way for Chic Studios grads to come participate and talk to potential inquiries about their time at our school. Potential enrollees also have a chance to see the space, talk to our staff, and also enroll for the next course in person. 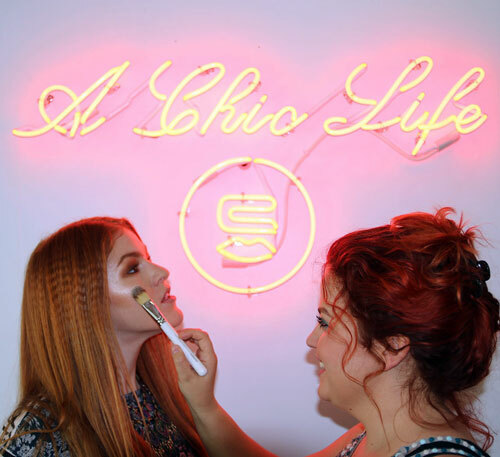 All across the country, Chic is participating in various makeup events and trade-shows where we help out our sponsors by using their products in our Chic Studios Complimentary Beauty Bar. 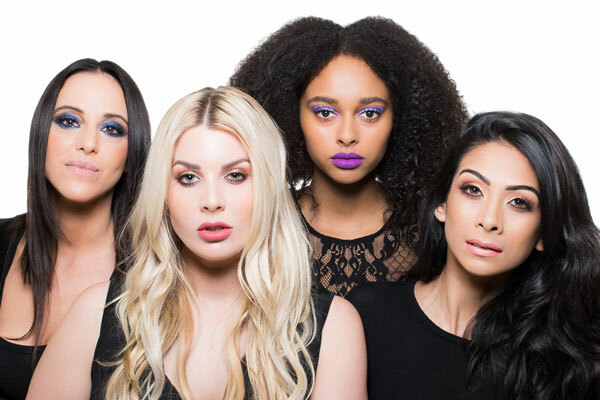 Last month in February, our Chic Pro team was a part of Makeup in Action Los Angeles where we had an Eyebrow Beauty Bar for attendees using products from our sponsors, Billion Dollar Brows, and Arch. ‌7) What’s your favorite makeup products/brands/tools right now? I am a very well organized person but when it comes to makeup and beauty products I am all over the place, I will try a new product for a few days, love it or leave it and then move on to others. At this very moment, I am loving the Skinceuticals custom D.O.S.E serum, which specifically targets discoloration and aging concerns. `I love all Milk Makeup products and my favorite foundation is Chanel Vitalumière. 8) You travel a lot, what’s your makeup travel hacks? I have a travel bag that I pack when I jet set and I couldn’t live without it, for a few two simple reasons, 1. multi-use and 2. hydrating. I travel with a small bottle of Fix+ spray from Mac Cosmetics, for skin hydration and also a healthy glow. I usually spray it all over my face, neck, and hands. Also, Milk Makeup balm for lips, eyelids, hands, all over skin + a mini Holographic Stick in ‘Stardust’ for eyes, lips and cheek color. 9) What are the makeup trends for 2018? I feel like trends come and go but when someone loves a trend they stick to it, so rather than a trend, I would say the ‘looks’ that are in trend or 2018 are glowing hydrated skin, which is best achieved with a skin oil or sheer shimmer cream, before putting on foundation or applying a ‘fix+ ‘ hydrating spray after makeup is done to help skin look fresh. You can also add a holographic glow to the skin with a cream or balm. Also, extra full lashes, not clumpy just full flawless long lashes. You can mix mascaras to build your lashes using black for a darker lash color with lengthening, then another for thickening lashes.